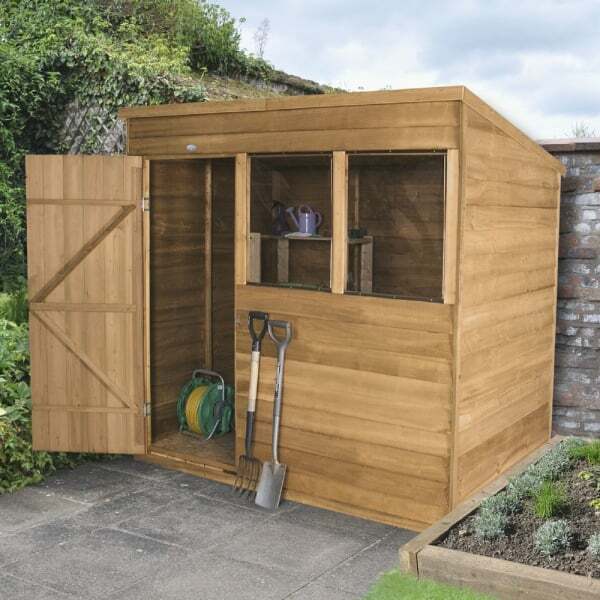 Forest Garden 7 x 5 Overlap Dip Treated Pent Shed: This Forest Garden Overlap Pent Shed gives you plenty of storage space for your garden essentials, the shed creates plenty of headroom at the front and is perfect no matter what your garden size. The pent roof slopes towards the rear of the shed which allows rain and water to run off the shed at the rear. The ridge height of 2m provides you with an increased head room so you can access the shed and store plenty of garden accessories and tools. The two windows are made from an unbreakable polycarbonate glazing which will let plenty of natural light to pour into the shed and are safely fitted with security screws. The floor and roof boards have been produced with a durable sheet material and the shed comes with a weatherproof felt covering. The Forest Garden Overlap Pent Shed has a strong and sturdy frame, a double braced single door with hidden hinges. To complete this lovely looking shed the barge board has been smooth planed to leave an attractive appeal.